With the start of Husker baseball beginning this Friday, players, fans, and coaches alike are excited to see the team get back out onto the field after a disappointing 2018 campaign. Last year, Nebraska missed out on the Big 10 Tournament entirely. After missing all of last season, there’s no question Luensmann is ready to get back. “It was tough to watch,” Luensmann said of having to sit out. “I couldn’t do anything about it. I think that was the biggest struggle that I had. There’s a whole new crop of freshmen players ready to get after it as well. Erstad’s newest recruiting class was rated the best in the Big 10 and among the top 25 in the nation, according to D1baseball.com. However, that doesn’t mean that Erstad will sit around and wait for his team to develop. They want to win right away. With the wait almost over, Erstad and the rest of the team have something to prove, beginning with a four game series against UC Riverside in California. 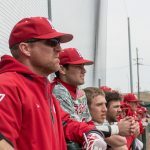 The Highlanders are led by their fifth year head coach, Troy Percival, Erstad’s former teammate while he was with the Angels of Major League Baseball. For Erstad and the rest of the team, Friday can’t come soon enough. * Coverage of Nebraska baseball games can be found on KLIN, beginning with pregame coverage at 7:30 on Friday. First pitch is set for 8 o’clock.